Whether you're launching a new product, acquiring a startup, or adding a few new marketing tools, your data architecture has to keep up with the constant evolution of your company. Not only do you need to enable new teams quickly, but you also need to enforce standards to ensure your data is consistent and trustworthy. For Segment customers, these company milestones are easier to manage with a central customer data infrastructure. However, they can still require a lot of manual set up in the Segment app to configure new data integrations. You may be tasked with adding or updating each new Source, Destination, and Tracking Plan with company-specific requirements. And while these requests might not happen often, when they do, you could spend hours redesigning and updating your workspace. We want to make it easier for you to perform provisioning tasks in bulk while giving you the option to work from an interface you’re already familiar with — your command line. 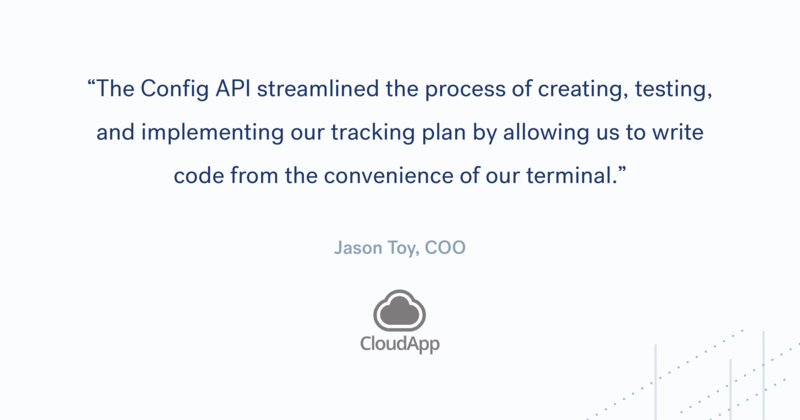 That’s why we’re launching the Config API, a new addition to Segment’s suite of developer APIs, which lets you programmatically provision, audit, and maintain the Sources, Destinations, and Tracking Plans in your Segment workspace. The Config API gives you access to resources, or objects, that you could previously only manage within the Segment user interface. For instance, you can use the Config API to automatically provision new Sources and Destinations preconfigured with your workspace preferences. Configure, disable, or view Sources and manage connected Destinations. You can even delete old testing Sources and Destinations! Call a list of all of your workspace Sources and Destinations to see how they are connected. Determine your next integration with a complete view of all the Sources and Destinations available in Segment’s catalog. Configure, update, disable, or view your Tracking Plan in Protocols to enforce a consistent schema at scale. Create living diagrams of their data flow using an up-to-date list of enabled Sources and Destinations within their account and the connections between them. Build integrations with Protocols and Github to ensure that any changes to a Segment Tracking Plan go through their existing application development change control process. Onboard new business units or internal partners to their customer data infrastructure with a single keypress. By executing provisioning scripts, new Segment users can have a fresh sandbox with all the standard inputs, outputs, and rules pre-configured. As your customer data infrastructure, one of our goals is to provide an exceptional developer experience. That’s why we want to make it easier and faster for you to configure data collection and to enforce data standards automatically with the Config API. With today’s launch of the Config API, Segment is committing to an API-first approach to product development. We believe this builds the foundation for a better product and developer experience. Read more about why we are choosing to be API-first and what it means to us here. The Config API is currently available to all customers. To learn more about the API, head over to our documentation try it out for yourself by following our tutorial here.